Duct tape, corrugated plastic, scissors and a level. As many of you know, my husband/best friend is a coffee-hater. Not only does he not like the taste, but he also hates the smell (I know, right??). As everyone knows, marriage is a balance and a compromise, and it takes work, sometimes. We figure things out as we go along. I try to minimize the coffee smell as much as he can, brew after he leaves for work during the week, and he disappears into the basement (where his office is) for an hour every weekend morning so I can have my coffee. About a year or so ago, my husband started getting into cocktails in a big way, and the cabinet that held our modest liquor collection quickly became too small. We turned our buffet into a bar, and my daughter said, "You know, Mom ... you should take take over that cabinet - and use it for coffee stuff." I suspect she had an ulterior motive - she LOVES coffee, and she'll say just about anything to get me to brew it more. Either way, it struck me as both convenient, and I needed SOME place to put my stuff. Plus - it is protected from exterior walls (it's a cabinet under our peninsula) and light, and it should help contain the smell. It worked great for a long time, but then it didn't anymore. 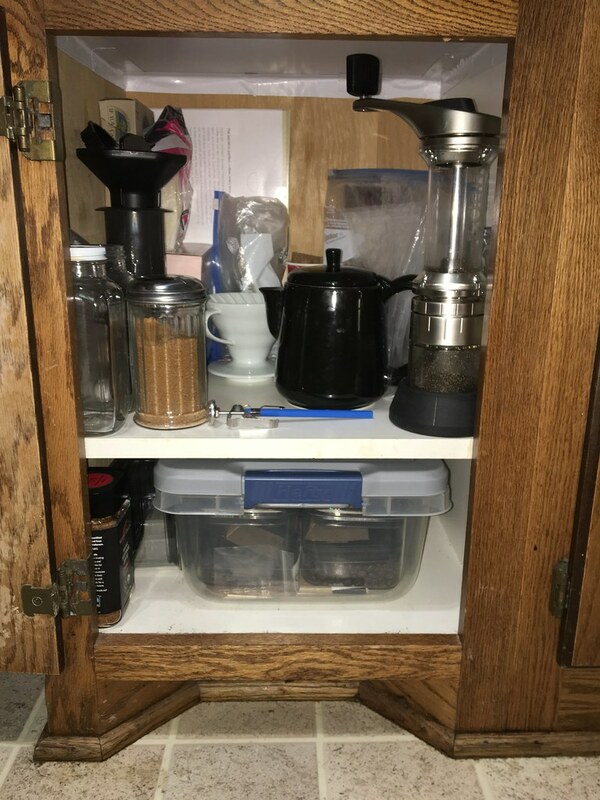 I can't be sure what changed, but Chris started to detect coffee smells whenever he opened the drawer above my coffee cabinet. 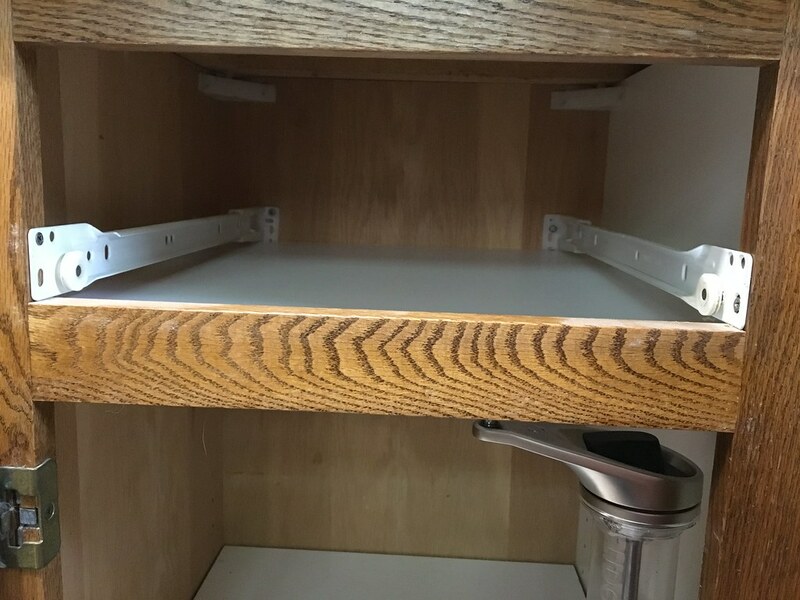 No surprise, really - there was no separation between the cabinet and the drawer - whenever the drawer was opened (it's where we keep the foil and sandwich baggies and parchment paper and stuff), as it basically opened the cabinet to the kitchen. For years, I'd kept my grinder double-bagged and in the plastic bin with the coffee beans, but since I got the Lido 2 grinder, it's just too big to do that conveniently. 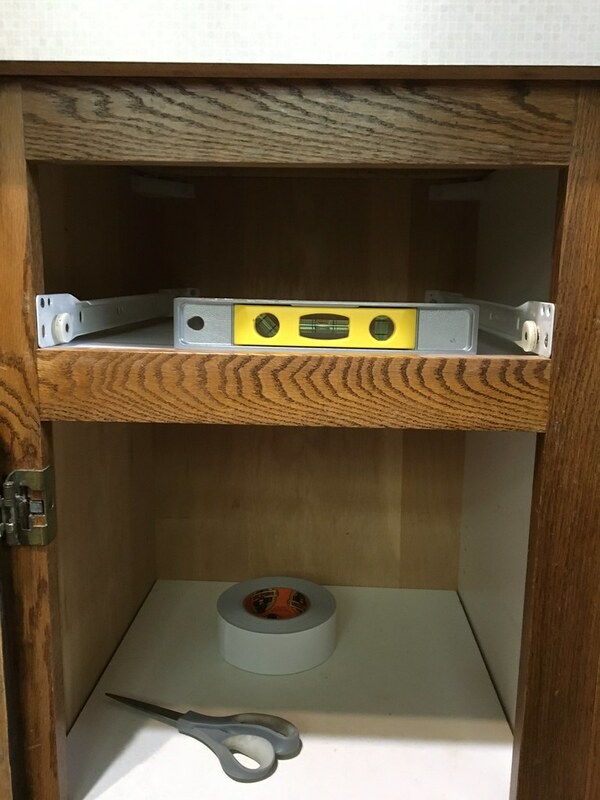 So it sits toward the front of the cabinet. It's got a lid, but it's not exactly hermetically sealed. The tipping point may have been the AeroPress, which I only use occasionally - which because it's plastic, absorbs coffee odors, and no amount of hand washing or trips through the dishwasher gets rid of the coffee smell. I suspect it was the combination of the Lido being added in January, and the AeroPress in April that did it. So, this spring we bought a sheet of corrugated plastic (the stuff that sign shops use) for $10, and some white duct tape (Gorilla brand). I took my coffee and equipment outside, and got to work. I had enough of the corrugated plastic to make two barriers, but only needed one. 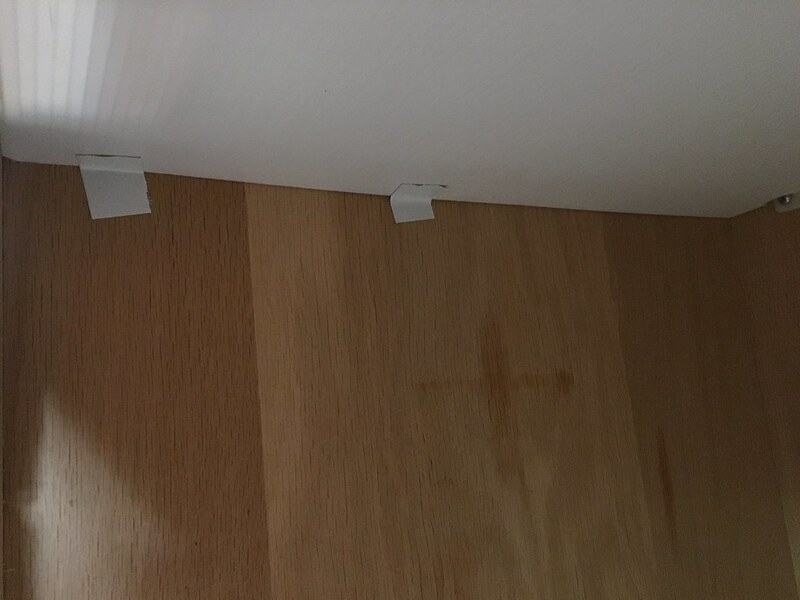 Took careful measurements: 16 3/4" x 17", then trimmed it until it wedged into place as close to drawer hardware as I could get it. Then I tested it. Did the drawer work freely? Was it high enough up to accommodate my tallest coffee gear (my Lido 2 grinder)? Yup, good to go. Lido 2 grinder fits below. Drawer rolls freely above. Next I used the level to make sure it was as even and flat as I could get it. Looks good. Then, I braced it in place with small pieces of duct tape, and tested with the level once more. Still flat enough to suit me. I used small pieces of tape to hold it in place. Finally, I used long strips of tape to to seal the gap surrounding the corrugated plastic. This was a heckofa job. I had to squeeze my arms and shoulders into that space, and getting the tape to release from my fingers without ripping it back out was a pain. Finally, the coffee-hater had a great idea, and made me a tool - a small strip of scrap corrugated plastic about 6 inches long. 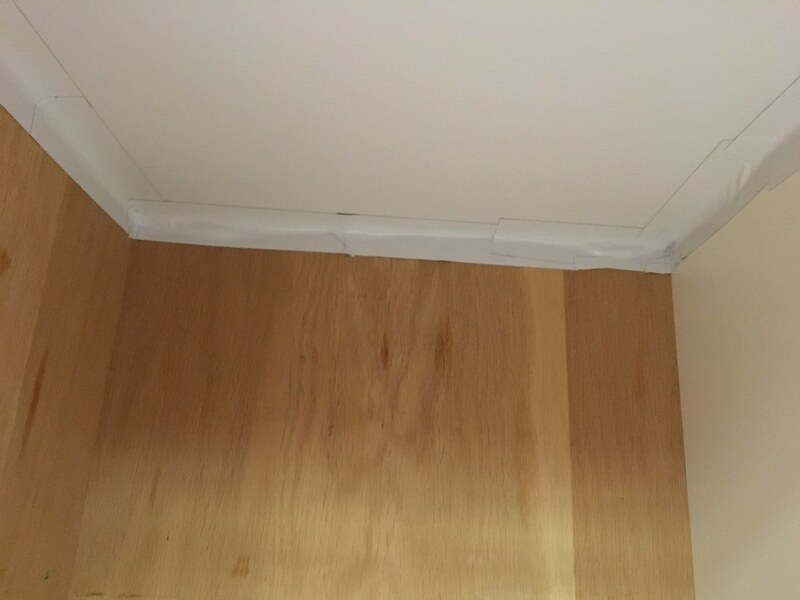 I folded each strip in half, sticky-side out, and inserted the piece of plastic inside, so that I could shove the fold right up into the bend between walls and ceiling. It went much faster after that. I sealed the corners with smaller pieces of tape. The finished separator - the drawer is above that ceiling. Here's the cabinet, refilled. My husband reports that the only time he can still detect coffee smell, is when he shoves his face into the open drawer, and sniffs for it. He said it wouldn't have bothered him at all if he hadn't had his face basically in the drawer. So ... I call that a success.